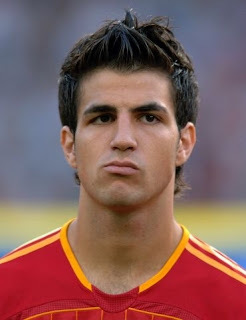 Francesc Fabregas Soler or Cesc Fabregas was born on May 4, 1987 at Vilessoc de Mar, Spain. Her nickname is Cesc, which is short for his first name. He loved playing football. Cesc Fabregas's father has a property company, As a child, his grandfather immediately enter Cesc to Barcelona football school. So most of the time spent playing ball Cesc. Fabregas started playing football at FC Barcelona, ​​During his career in the youth team, he was always playing as a defensive midfielder or a Spanish term Volante. Despite being a fairly prolific scorer since managed to score more than 30 goals in a season, but he never had the opportunity to play in the first team at the Camp Nou (FC Barcelona Headquarters). Feeling limited playing opportunities if he stayed at FC Barcelona he decided to move. On 11 September 2003, Cesc Fabregas finally moving to England and playing with Arsenal. League games or conditions known to kick and rush to make him a little confused. Cesc is a Latin guy who hooked dodging the ball. At first stay in the capital of London made him difficult to adapt, but then he began to make friends with team-mate Philippe Senderos, who helped him adapt to life in London. At the age is still 16 years old, never thought Fabregas into the first team but he's up to his seniors, Patrick Vieira and Gilberto Silva, while concentrating on training and learning the English language. Not long after, she debuted on October 23, 2003 in a League Cup match against Rotherham United. By playing him in the game, he became the youngest Arsenal player to the age of 16 years 177 days. He did not always play for the Gunners (Arsenal FC title) in his first season with Arsenal FC, but followed by an injury to the linebacker core in the 2004-2005 season, the chance of playing for Arsenal FC increases. Not long after, he got the confidence to be a core player in central midfield with Gilberto Silva. After becoming the first team at a young age, he managed to break several club record that has a reputation as a player who has talent with good technique, pengoper ball very well, and be a key player on his team. Gilberto Silva currently serves as defender, Fabregas has a primary function as a playmaker or a playmaker. Not long after he was finally able to perform plays in the first team in Premier League matches in the 2004-2005 season, before he had only appeared in a League Cup match. First match of the season was in the championship game in 2004 Community Shield against Manchester United with a 3-1 victory. With the injury to Patrick Vieira, Fabregas senior positions in and replace Patrick Vieira and appeared in four consecutive Premier League matches. He won praise in the game, he even scored a goal in a match against Blackburn Rovers with a 3-0 victory, and becoming Arsenal's youngest player to score in Premier League matches. With continued injury to Edu and Gilberto Silva, the chance to play these young players grow for all competitions. In the UEFA Champions League, he became the second-youngest goalscorer in the history of the competition, he scored a goal in the match with a 5-1 win against Rosenborg. Fabregas put an end to his first season with Arsenal FC by winning his first FA Cup Final match against Manchester United FC which ended Arsenal on penalties to win 5-4. In 2006, he made the decision for his career to play with Arsenal FC by signing a long term contract 8 years. In international matches, Fabregas Spain recorded as the youngest player at the World Cup in the match Spain vs Ukraine in Leipzig on June 13, 2006 at the age of 19 years 41 days still. His career began as a national player of the level of young players, representing the U-17 team at the World Championship match U-17 World Cup in Finland in 2003. After the departure of Arsenal captain Patrick Vieira to Juventus, Fàbregas regularly in the Arsenal central midfield alongside Gilberto Silva. Having inherited the number back four of Vieira, Fabregas made 49 appearances in all competitions during the 2005-2006 season. Despite his young age, his performances continue increasing scrutiny following his involvement in the first team. Furthermore, because Fabregas has a smaller body posture and play less aggressively than Vieira, many doubt his ability to fill the void left by Vieira. However, Fabregas displays its own style of play and impressed observers in the game of football in the Champions League against Real Madrid and Juventus. In the match against Juventus he scored the first goal and give feed the ball to Thierry Henry who scored the second goal, Fabregas at the same time proving that he can face the game and tackling midfielders like Vieira hard. He then played in the Champions League final game against his former club Barcelona, ​​but Arsenal lost with the score 1-2, with Arsenal these results complement the 2005-2006 season without a trophy. With increasing speculation Fabregas transfer in the summer, Real Madrid wanted to sign him even though Fabregas has established long-term contract with Arsenal. But Arsenal manager Arsene Wenger said he would not listen to offers from any of the players. In September 2006, with the remainder of the contract remaining 6 years, Arsenal's new bid is a contract 8 years later Fabregas approved and signed on October 19, 2006 While the term of the contract is not the usual length, Fabregas said that Arsenal's style of play and Manager Arsene Wenger as reasons for long-term commitment to the club Arsenal FC. As a result of his performance at the U-17 team, he was called by Luis Aragonés, Spanish national team coach, to become a senior player in the Spanish national football team and played in the 2006 World Cup in Germany (9 June to 9 July 2006) and the European Cup 2008 (7 to 29 June 2008) in Switzerland and Austria where the tournament champions Spain came out as well as making Spain a Rank 1 in the FIFA World Rankings list in this tournament and Fabregas being one of the key players. Fabregas finally chose to return to his home club, FC Barcelona and FC Barcelona officially become a player after the transfer process is a tough between FC Barcelona and Arsenal.Ia camps binding contract with FC Barcelona until 2016 with his buy-out clause worth 200 million euro.Pertandingan debut occurs when the Spanish Super Cup against Real Madrid.Ia added to 83 minutes to replace it prints Pedro.Gol first time Joan Gamper Cup FC Barcelona at the same time deliver a champion after defeating SSC Napoli 5-0.Ia also contributed one goal in the match UEFA Super Cup and the first weekend of the Spanish league match at Villarreal CF FC Barcelona slaughtered 5 goals without reply.